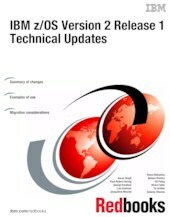 This IBM® Redbooks® publication provides a broad understanding of the changes, new features, and new functions introduced with IBM z/OS® Version 2 Release 1 (2.1). This new version marks a new era of z/OS. Version 2 lays the groundwork for the next tier of mainframe computing, enabling you to pursue the innovation to drive highly scalable workloads, including private clouds, support for mobile and social applications, and more. Its unrivaled security infrastructure helps secure vast amounts of data. Its highly optimized availability can help you deliver new data analytics solutions. And its continued improvements in management help automate the operations of IBM zEnterprise® systems. With support for IBM zEnterprise EC12 (zEC12, Enterprise Class) and zEnterprise BC12 (zBC12, Business Class) systems, z/OS 2.1 offers unmatched availability, scalability, and security to meet the business challenges of cloud services and data analytics and the security demands of mobile and social network applications. Through its unique design and qualities of service, z/OS provides the foundation that you need to support these demanding workloads alongside your traditional mission-critical applications. This presentation on z/OS V2.1 (June 2014) represents an update to the WinterShare 2014 presentation and reflects z/OS enhancements delivered since general availability last Fall. Please listen to John Eells of our Technical Strategy team present this one-hour comprehensive technical overview of z/OS V2.1.